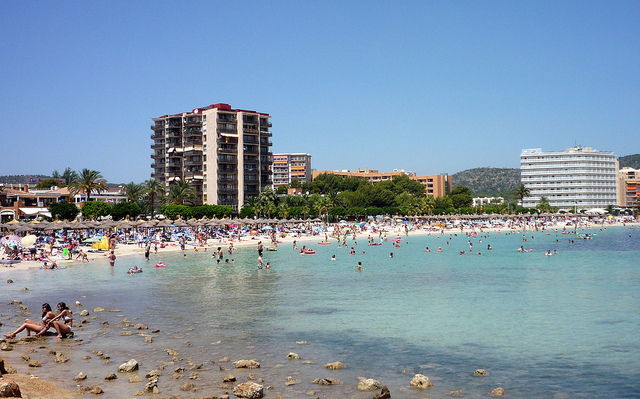 The ever popular resort of Magaluf lies 28km from Palma Airport on the southwest coast of Mallorca. It has long been a favourite destination for holidaymakers of all ages with enough attractions to keep families, singles and retired people coming back year after year. Magaluf is particularly well known for its nightlife during the summer season when it competes with Benidorm and Ibiza as one of the liveliest places to go in the whole Mediterranean region. Its top nightclubs such as BCM are well known by clubbers throughout Europe and some of the top DJs from the UK turn up here for short stints during these months. However, there’s plenty more to Magaluf than its nightlife such as its beautiful beach with its fine sand, clear water and diverse watersports. Along the beach there are small kiosk bars set up during the day which play great music and there’s some good British pubs nearby such as Linekers which has ice cold beers and live sport all day long. You’ll find plenty theme parks around Magaluf to pass your time including Marineland which is just 4km east at Portals Nous and the waterparks of Aqualand and Western Park which are just on the main road heading west out of Magaluf. For a brilliant evening of entertainment for all the family you should go to the Pirates Adventure which is the island’s number one show. For something a little more active you can enjoy a round of golf at one of the nearby courses. For great value packages to Magaluf it’s well worth checking out the great deals at easyJet Holidays. Getting to Magaluf is very straightforward. On arrival at Palma airport you can take a taxi, get a bus into Palma bus station then change to one heading for Magaluf or simply pre-book an airport transfer which is the best option if there’s a group of you. Although Magaluf has developed a reputation as a resort for the 18-30 crowd it is also a great family destination with plenty to keep the children amused. The large beach provides many hours of fun for most families and there are numerous watersports available for older children as well as climbing frames for youngsters at the back of the beach near the bars. Western Water Park: The Western Water Park is a themed western town with shows and a good selection of slides. Teenagers will love the Magaluf Karting track. Marineland: Just 10 minutes on the bus towards Palma from Magaluf is Marineland at Costa d’en Blanes where there’s a fabulous dolphin show as well as a fine selection of marine life including sharks, penguins and sea lions. Puerto Portals: Take a stroll from there down to the marina at Puerto Portals where there are some beautiful boats (or are they called yachts?). All around the island there are boat trips many of the glass bottom variety. Pirates Adventure: One show that everyone should go to see no matter what their age is the Pirates Adventure in Magaluf. This show attracts around 200,000 visitors every year and for the majority it is the highlight of their holiday. It is set in a theatre which contains a life size galleon where you’ll enjoy dinner with a pirate theme as you watch a superb show for all the family. There is also an uncut version for adults only. Jungle Parc: For those looking for something more active and thrilling there is the outdoor adventure park Jungle Parc which is located in Santa Ponsa only 8km from Magaluf. It has 2 adventure courses which take you from tree to tree by means of rope bridges, swings, slides and more. The Pirate course is suitable for children from 4 to 10 and has 25 challenges all based on a Pirate theme. The Explorer course is suitable for all the family and has 2 different levels for the more or less adventurous. 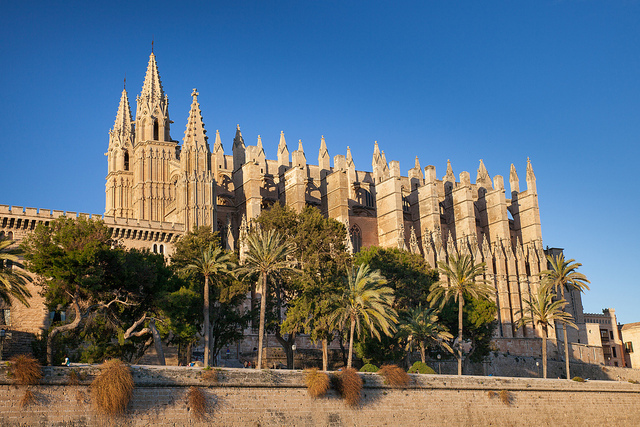 Visit Palma: You can take a local bus and head into the island’s capital city, Palma de Mallorca, for the day. In Palma the ‘hop on, hop off’ bus services are a good way to get around and see the Cathedral, Bellver Castle and the marina without having to walk too far. From Palma you can take a full day excursion to Soller on a vintage train which is a lovely day out slowly travelling through the island’s beautiful countryside. Golf Fantasia: Nearer to home is the Golf Fantasia mini-golf course in Palma Nova which has 54 holes set in beautiful gardens with waterfalls. This is popular with adults and children alike and is floodlit for evening rounds. If you fancy escaping from the kids and playing a proper round there are 18-hole golf courses nearby. Magaluf nightlife: At night most nightlife focuses on a stretch of bars known as ‘the Strip’. This tends to be geared towards party animals rather than families though you will find a few places that are more child friendly than others. Away from the disco pubs you’ll find plenty family bars serving up British food which are most welcoming to children. Many such places have nightly entertainment of a family nature. Cave Excursion:Over on the east coast are two stunning cave structures at the Caves of Drach and the Caves of Hams near Porto Cristo. There are regular coach excursions there from most resorts or just drive there via Manacor. Next to the Caves of Drach is the Acuarium de Mallorca which is a small aquarium with a selection of sea creatures including piranhas. Rent a Car: Whilst there’s plenty to keep you amused for a fortnight in and around Magaluf, you’ll be richly rewarded if you decide to rent a car and head out to explore beyond the resort. Just to the west are some fabulous beaches such as Portals Vells. Further afield you can drive to the quaint beachside hamlet of Sant Elm on the island’s south-west tip overlooking the island of Dragonera for a paella lunch at one of the beachside cafés. Or drive up to Soller along the rugged south-west coast to discover the real beauty of this magnificent island. If you prefer not to drive there are plenty excursions to popular attractions around the island. This is one of Magaluf’s few first class hotels which attracts repeat visits from its clientele time and time again. It is right on the beach and has large, spotless rooms with excellent amenities. The food in the restaurant is varied and top notch whilst the entertainment provided is first rate. Located away from the chaos of Magaluf centre the Sol Barbados Hotel is a firm favourite with families and for mature visitors in general. Good choice of hotel which attracts families and revellers alike. Ideal location with easy access to the beach and all facilities. Superb swimming pool, great entertainment and good quality and range of meals to satisfy every taste. Highly recommended hotel which attracts rave reviews from clients. Well located, first class facilities, excellent meals and a great team of holiday reps who will do all they can to ensure you enjoy your stay in Magaluf. The diversity of Magaluf nightlife is such that there is something for everyone. For the 18-30 crowd there are hundreds of bars and some of Europe’s best clubs and discos. For maturer visitors and families there are more laid back bar venues, many with excellent entertainment and a good selection of places to eat. Most of the nightlife is centred on the bars and clubs which are located along what is known as ‘the strip’. This is a hill called Punta Balena which runs from the main tourist information office in the town centre up to the hotel district of Torrenova. It’s pointless to list all the bars along the strip as they often change owners between seasons and not everyone shares the same taste in bars. Just start at the top or bottom of the strip and go walkabout to find your own favourites often with the help of the endless number of PRs who will be trying to get you into their place. Well known favourites that you can’t miss as you stroll along the strip include Lennons Pub which has a massive terrace and Chaplins Bar which is famous for its party games. The Lush Dance Bar is another top entertainment spot whilst The Office has become a regular stop for revellers. The Three Lions is always packed and Mulligans at the top of the hill is yet another top venue. As well as the strip you’ll find plenty to amuse you actually down at the beach where there are numerous bars and restaurants open until late. Daquiris Palace do a fabulous range of frozen cocktails on their huge terrace overlooking the sea whilst. The Boatyard is a good British pub which is also on the beach and Linekers sports bar with its eleven giant screens is on a street just off the promenade. On Avinguda de l’Olivera, the main street where the BCM nightclub is located, you’ll come across a good selection of more familiy orientated bars than you will on the strip. The enormous and ever popular Benny Hills is well known for good, clean family fun whilst the Boston Bar provides great entertainment for all the family. Mrs Doyles Irish Pub is Magaluf’s top Irish venue with live music from Mick the Fiddler. It’s just around the corner from Morgans. Magaluf clubs are well known on the European club circuit these days and attract well known DJs during the summer months including Judge Jules, Dave Pearce and DJ Sammy. These stars tend to rotate around the top venues guaranteeing packed houses with clubbers from all over the continent. The largest and best known of the nightclubs is BCM Planet Dance which has space for 4000 people and is built on three levels. The top floor tends to attract a younger crowd dancing away to the latest sounds in the company of professional dancers and an amazing light and laser show. A middle floor is mainly frequented by a slightly older crowd whilst on the lower level is the Millennium club which is home to notorious foam and popcorn parties. Outside there’s the BCM square with a selection of bars and seating areas where non-dancers can enjoy the action. The entrance fee gets you into the club, a load of freebies and includes free drink for the rest of the night within the club complex or at the BCM Beach Bar which is at the bottom of the strip. It’s open from 10pm until 6am. Take a look at the BCM Magaluf website. Poco Loco is another top venue which claims to be the resort’s best disco party pub. They have their own resident British DJ who keeps the crowds bopping on the large dancefloor until the early hours. Very popular with stag and hen groups all kitted out in fancy dress. Check out any special offers of the day with the PRs. Good selection of music and drinks tend to cost no more than standard bars. Boomerangs, Fusion and Bora Bora are other top venues whilst Heaven is a popular lapdance club. Bananas – one of the longest established and most popular clubs around. Boomerang – a more recent addition to the strip which is one of the top dance venues. Carwash – where the theme is geared to the sights and sounds of the 70s and 80s. Tokyo Joes – where you can escape the house music and easily get to one of its bars. Magaluf is the ideal destination for stag weekends. It has hundreds of bars and a fine selection of clubs and disco bars. The main social scene centres on a street known as ‘the Strip’ which runs from the Magaluf tourist information office in the main town up a hill to the mainly hotel district of Torrenova. Along this stretch you’ll come across one bar and disco after another which all want your business. Drinks prices are very reasonable thanks to the competition and you should look out for special promotions and ‘happy hours’. Most of these bars and discos are very welcoming to stag parties having seen it all before for many years. It’s a common sight in Lennons Pub, Chaplins Bar and a host of others to see groups of men in fancy dress getting tanked up during a stag weekend. A particularly welcoming venue is the Poco Loco disco party pub which has a large dance floor and very reasonable drinks prices which tends to attract most stag groups at some point during their stay. As well as the cheap drink and massive selection of bars this is a well established stag destination thanks to the ample supply of cheap hotels. Alternatively, for group bookings it’s worth taking a look at what self-catering apartments are available as this option often proves cheaper than hotels. As well as the inevitable bar crawl there are some great nightclubs in Magaluf including BCM which is the island’s biggest with space for 4000 ravers. Obviously this is a major attraction amongst stag groups especially when it’s foam party night. The Pirates Show is popular wit stag and hen groups who should go to the uncut version rather than the earlier family version. What about activities away from the bars and clubs? Well the beach is first class with plenty golden sand and lovely turquoise water. A good range of watersports are available (or just have a frozen cocktail at Daquiris Palace if you prefer). There’s a great waterpark called at Western Park on the outskirts of Magaluf just beyond the go-karting track and there are golf courses nearby. The Pirates Show in Magaluf is the highlight of the holiday for the vast majority of visitors to the resort. Almost without fail both adults and children alike rave about the show which has attracted over three million visitors since it began in the mid 1980s and many of them say it is the best thing they have done in Mallorca. The show is based in a large theatre in Magaluf which contains a life size pirate ship as the main set. You choose a seat on either the quarter deck or the main deck of the ship or the Captain’s table and enjoy a fabulous night of interactive entertainment with a buccaneers feast and pirate’s punch included. The price you pay depends on which of the three areas you choose to sit in but no seats are far from the stage and transport from other resorts to Magaluf is included in the price. The food provided is sausages, chicken, chips and coleslaw and although not gourmet it is plentiful and you can ask for more. The punch is sangria which is not too strong but tasty and of course you can buy other drinks at the bar. The entertainment tells the story of Captain Morgan and his sailors who sailed the seven seas in search of treasure. One night they come across an evil French pirate who steals their gold and jewels which sets up a pirate adventure story as the two pirates fight it out to rule the high seas. The Pirates Adventure is a great family night out involving highly talented gymnasts, dancers and acrobats from all over the world and consists of two halves of around 45 minutes and a 15 minute interval. The show is fast, energetic and full of life with great music to sing along to and plenty of comedy in it too. The stunts that are performed are breath taking with some involving fire. In general audience participation is encouraged in the show. There is also a Pirates Reloaded version which tells the same story but with some bad language and fewer clothes! The reloaded version does not include a meal but the punch is free all evening. The family version takes place every evening from Wednesday to Saturday with some other performances in the high season whilst the reloaded version is held every Friday night and Mondays and Wednesdays in high season. It is a very good idea to book in advance especially in summer when there is lots of demand and queues can be quite long. Also you get a cheaper price when booking in advance than on the night. There is a VIP ticket which is obviously more expensive than the other tickets but includes a complimentary drink on arrival, a small bottle of wine, a souvenir program and you get to meet and chat to the cast.